Ryan Stevenson has praised the fans for making Hearts "special" as he welcomed the news the Tynecastle club are set to exit administration. Businesswoman Ann Budge is on the brink of taking over after a meeting of creditors in Lithuania this week. And 8000 supporters, making up the Foundation of Hearts, have been paying monthly direct debits to raise money. "I'm blessed that I am playing for such an amazing club. You can see the backing of the fans," said Stevenson. "Everyone's in it together, everyone's been trying to save the club. "Would I have put money in if I was a fan? Maybe the first time, but these fans have done it two or three times. "It then filters into the players and it makes them realise how special the club is. The 29-year-old midfielder is in his second spell at Tynecastle having returned in summer 2012 after six months with Ipswich Town. "I've been here, gone away," he said. "I would not be back if I did not think it was a special place to be." Stevenson, along with Jamie MacDonald and Jamie Hamill, agreed wage cuts to help Hearts out after they went into administration in June. 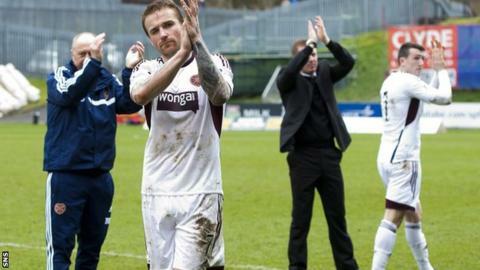 And, while he admits it has been a difficult time, Stevenson is hoping to stay at Tynecastle for the rest of his career. "It has been a long road, a tough year for everyone and hopefully we can put this year behind us and move on to bigger and better things," he added. "Personally, this has been a horrendous year. Everyone connected with Hearts has had to make sacrifices, whether that's the fans digging into their pockets, not just the once or twice, putting everything on the line. "The boys have had to make sacrifices themselves. The three of us have obviously taken our wage cuts and it was a hard thing to do, but we've done it. "And it was just relief knowing that, first and foremost, the club's saved and hopefully the three of us can get our futures sorted as well. "If I can end my career here, I'll definitely be doing that."